UPICares volunteers had a blast at N Street Village’s Night at Nationals Park last week. 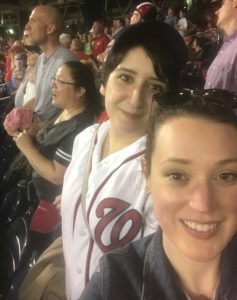 Although our local team lost 2-4 against the New York Mets, the ‘friendraiser’ was a home-run for the women’s shelter that supports nearly 2,000 women a year. UPIC employees that made in-kind donations to N St were entered into a raffle for a pair of tickets to the game. We made sure to take into consideration their most needed items at the moment: travel sized toothpaste (supplies were recently exhausted) and deodorant. Nat fans intently watching the game. N Street allocated great seats for the game and each ticket included a $10 concession credit and $5 donation to the Village. 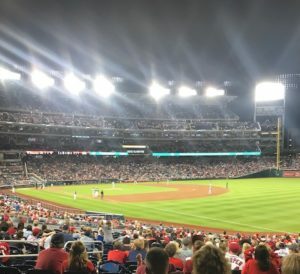 To add to the excitement, the Washington Nationals honored local charities and organizations with Spirit Awards during the pre-game ceremonies. 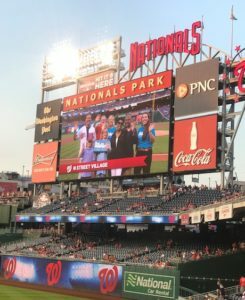 Before the first pitch, N Street employees were invited onto the ball field to accept a Spirit Award. N Street’s mission was featured on the big screen twice, along with the logo that features a D.C. skyline. N Street provides basic needs such as beds and warm meals for those in need. And daytime services include dental care, shelter, and wellness services, such as yoga, and much, much more. N Street’s mission is to empower homeless and low-income women in Washington D.C. to claim their highest quality of life. The Village serves about 208,000 meals and facilitates more than 5,000 showers per year. Discrimination, 81% percent are women of color. UPICares volunteers had a blast at the game! UPICares also is partnering with N Street in a workforce development program that clients of the Village can participate in. The program will help clients develop communications skills and prepare to get back into the workforce. Author Jessica Lay is UPIC’s Program Lead for UPICares, the organization’s philanthropic initiative. She spends half of her time assisting patients through UPIC’s contact center and recently completed a degree in Aging Services Management. Follow us on Twitter and Instagram @UPICHealth.